1. Preheat the oven to 200°C, gas mark 6. 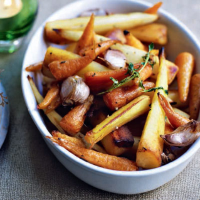 Blanch the parsnips in boiling water for 4 minutes, then drain; toss with the remaining ingredients in a roasting tin. Spread out in one layer and season. 2. Roast for 50-55 minutes, stirring halfway through, until golden.